It all started with the marathon blog post. I wrote that post last week in a silent house. Jude was at school. Evie was napping and Indigo had fallen asleep on the couch. Indigo gave up naps a year or so ago, so when she decided to crash at 11 am, I knew she was coming down with something. I wasn't feeling well a couple of days prior, so I figured she just had what I had. When she woke up she was running a 102 fever. By evening it was up to 105. Generally I'm not one to get too worked up when my kids spike a fever. But 105? I was sweatin' it. Now Ms Indigo has been one pretty healthy kid. She has yet to be on a single round of antibiotics. But, of course, said fever occurs while Dan is out of town in New York on business travel. He hasn't traveled overnight for work in over two years. To make a long story short - two trips to the urgent care, two trips to the ER per doctor's orders, two IV lines, one catheter, and one early plane ticket home from New York later, we found that Indigo had a virus. It took them a long while to sort out because her white count was quite elevated. This can sometimes happen with viruses, but they needed to rule out an infection. Thankfully, thank.ful.ly. my neighbors both to the right and left of us came through in a big way during the time that Dan was gone. One of my neighbors watched Evie and Jude until 12:30 am. Let me add that she has two kids of her own and her husband had been out of town for several weeks in Japan for business. The other neighbors watched the kids the next day when the dr insisted that Indigo be taken directly to the ER. Then they brought over fresh bread! I was moved by their willingness to help us and cannot imagine having to manage an incredibly sick Indigo, plus a baby and a five year old while waiting hours in the ER. I'm so grateful for them! So grateful. 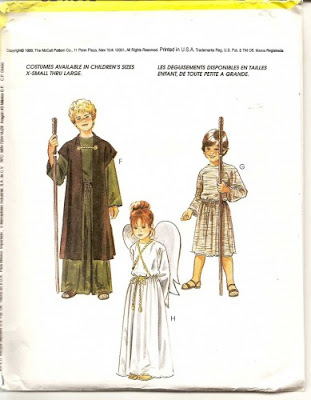 Out of plethora of costume pattern choices, Jude landed on this shepherd boy costume. Lately, his dress up theme of choice has been "Bible action heros". Indigo settled on another kitty costume. She initially wanted a turtle, but I was able to talk her out of it. Whew! 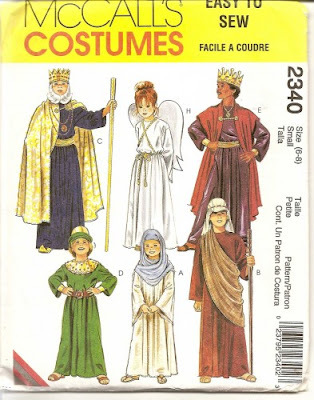 I used Kwik Sew 3099 and it really was a joy to sew. 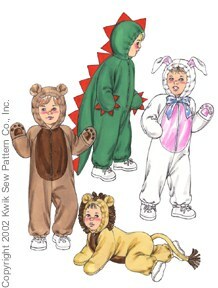 I used this pattern before when I made the kids a dragon and kitty costume. This time I used a pinking shears to finish the seams. It's fleece and didn't fray at all last time, so I figured we were good with just pinking shears. Keepin it simple. Finally, a smile, which I got only by holding the camera at chest level, so she could see my face while the camera flashed. Evie's been spending a lot of time in the backpack these days. She was none too pleased with all the attention Indigo needed last week. She loves riding along in the backpack while I do my work, but has decided that her new favorite game is to pull my hair as hard as she can. I pulled it up to deter her, thus my rockin hair style. Evie, waving "hi" to Jude... but concerned over the camera flash. As far as baby wearing goes, my favorite carriers are my Mei Tei for the front carrier, Ergo for back. Hands down. Wishing you all a healthy and happy Thursday! So sorry that Indigo was sick. My temperature got up to 104 when I had the flu and it was miserable. I'm so impressed at how you just whip up those costumes. They're really cute. Oh no! Yikes! So sorry to hear about sweet Miss I being sick and so happy to hear she is on the mend and the other two munchkins didn't get it! And oh my! Those costumes....absolutely amazing! There is something so sweet about the fact that Miss E smiles when she can see Mama's face. That melts my heart! Beautiful kiddos one and all! Oh I wish I would've been able to help you out last week! So glad Indigo is better =) Loving our time together on Tuesdays and looking forward to a play date next week! Have a great weekend - pray for a successful garage sale. It's such hard work but well worth it!